Using HoloLens and Acer headsets in a shared environment is fascinating. For years, Microsoft has been talking about its dream of mixed reality -- the idea that AR and VR headsets can work together in harmony across virtual and physical environments. But until now, it really has just been talk. At its Build developer conference this week, I finally saw a mixed reality demo that made Microsoft's ambitious vision seem achievable. It was more than just shared VR -- something we've seen plenty of already -- it was a group experience that brought together HoloLens and Acer's virtual-reality headsets in intriguing ways. To be clear, I was running through Microsoft's Mixed Reality Academy at Build, a simplified version of a developer class meant for journalists and analysts. It goes over the basics of building a virtual experience in Unity, while also giving you time to actually explore those environments. 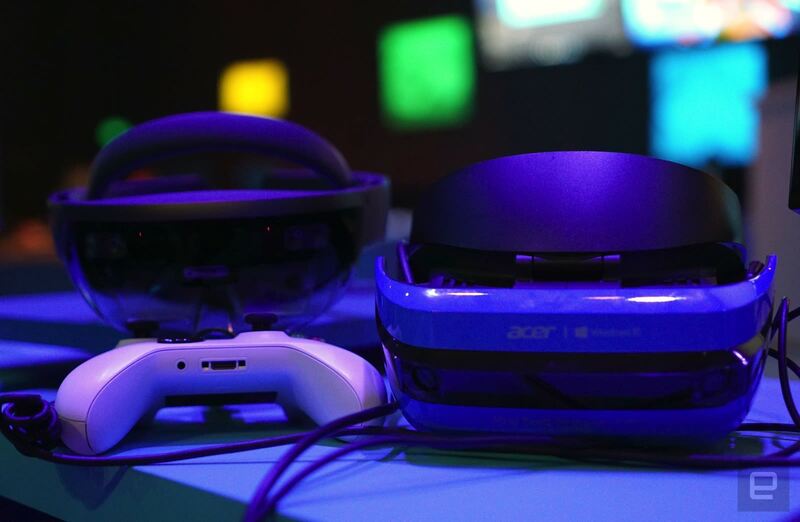 I went through an earlier version of the class two years ago that was entirely focused on HoloLens, but this week's version showed how HoloLens (and future AR headsets) can coexist with Acer's Windows 10 VR gear. The centerpiece of this year's demo was a puzzle-filled island, which featured a beach, a small forest and a large volcano. 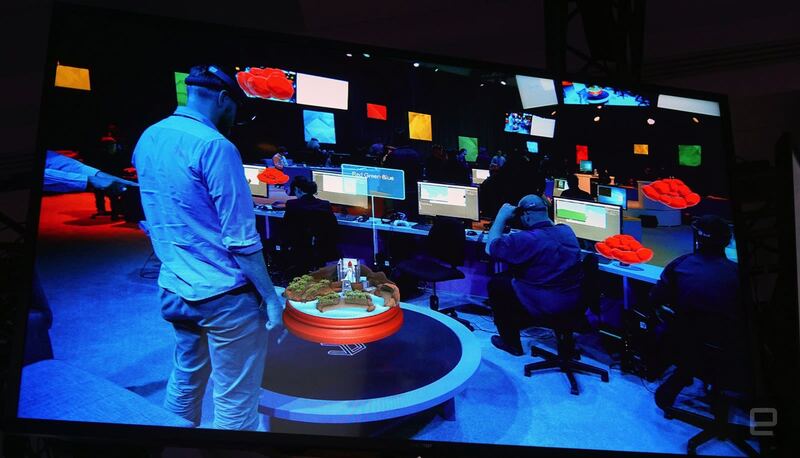 Like all-seeing gods, the HoloLens users could see the VR headset wearers' tiny avatars running through the island. Everyone wearing an Acer headset, meanwhile, had an on-the-ground view, with the HoloLens viewers appearing as menacing clouds in the horizon. The demo is basically an example of how these different types of devices could be used to observe a single environment. After stepping through the Unity setup once again, which mostly involved enabling a bunch of scripts and templates that Microsoft set up for us, I was able to slip on a HoloLens headset and view the floating island. I used the Air Tap gesture to select it, which involves holding my fist up and raising my index finger, and then gazed at different locations around the room to move the island around. While it was cool, it was also standard HoloLens fare. Things got a bit more interesting once I put on the Acer VR headset, which let me see the island much more clearly than HoloLens. That's partially because of the higher resolution screen on the Acer headset, but VR also has the advantage of letting you focus more clearly on virtual objects than HoloLens' AR. Microsoft didn't have its new Mixed Reality Controllers on-hand for the demo, so I was stuck using an Xbox One gamepad to move around the environment. Moving into the shared mixed reality experience made the differences between the two headsets even more palpable. Wearing a HoloLens headset felt oddly powerful, for example. We learned how to throw lightning bolts into the island by bringing two fingers together, a gesture that mainly seemed to exist to freak out the VR headset wearers on the ground. When I donned the Acer device, I found myself on the beach and was immediately struck by the shift in scale. Instead of peering down from high above, I was now walking amongst the trees. I made my way to a passcode-protected door with a not-so-subtle hint: "I love pie." After entering 3.14, the door opened and I was presented with another task, which involved stacking colored blocks in the right order. While I was solving puzzles, other VR-headset-wearers on the island were going through trials of their own. Eventually, a doorway opened into the volcano at the center of the island, where a large rocket was housed. Technically, I was supposed to work together with my teammates to launch the rocket. But, somehow, I ended up teleporting underneath it, which made it impossible for us to complete the puzzles. I've been through several shared-VR experiences, most recently at this year's Tribeca Film Festival, but Microsoft's demo felt completely different. The mixture of HoloLens augmented reality and traditional VR allows for multiple perspectives that wouldn't be possible with virtual-reality headsets alone. The shift in scale, in particular, could be particularly helpful. I could see remote teams using a combination of the two technologies to collaborate on projects together. Each headset also has its strengths and weaknesses. HoloLens gives you a wireless digital lens over the real world, but it's expensive and, due to its limited field of view, it's not ideal for letting you explore immersive environments. The Acer VR headset, meanwhile, is far cheaper at $299 and lets you completely surround yourself in VR worlds, but it also needs to be tethered to a PC. 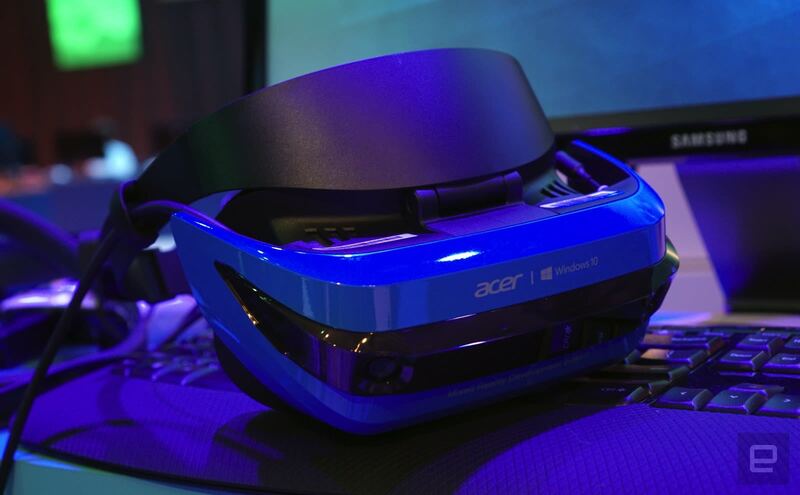 Throughout the demo, I was mostly struck by the Acer VR headset's comfort and clarity. I've already had some hands-on time with it, but I'm still surprised at just how light it is. The big takeaway, at this point, is that there's plenty of potential for AR and VR headsets to work together. And compared to others dabbling in these fields, Microsoft is in a unique place. It's the only company with a single platform that can support both AR and VR, and it also has plenty of hardware experience that others don't. The company is already planning to bring MR into living rooms next year via the Project Scorpio console. The big question for Microsoft: Can it make developers believe in its mixed reality vision, too?